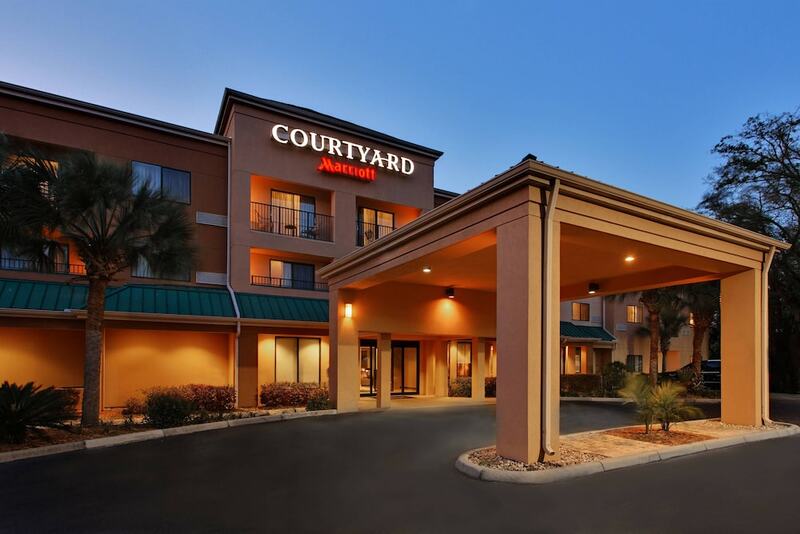 With a stay at Courtyard by Marriott Gainesville in Gainesville, you'll be within a 15-minute drive of University of Florida and Shands at the University of Florida. This hotel is 4.5 mi (7.3 km) from Ben Hill Griffin Stadium (The Swamp) and 15.7 mi (25.2 km) from Gainesville Raceway. Make yourself at home in one of the 81 air-conditioned rooms featuring refrigerators and Smart televisions. Complimentary wired and wireless Internet access keeps you connected, and cable programming provides entertainment. Bathrooms have complimentary toiletries and hair dryers. Conveniences include phones, as well as safes and desks. Grab dinner at The Bistro, a restaurant that specializes in American cuisine. You can also grab snacks at the coffee shop/café. Wrap up your day with a drink at the bar/lounge. Cooked-to-order breakfasts are served on weekdays from 6:30 AM to 10:00 AM and on weekends from 7:00 AM to 11:00 AM for a fee. Featured amenities include a business center, express check-in, and express check-out. Planning an event in Gainesville? This hotel features 546 square feet (51 square meters) of event facilities. Free self parking is available onsite.